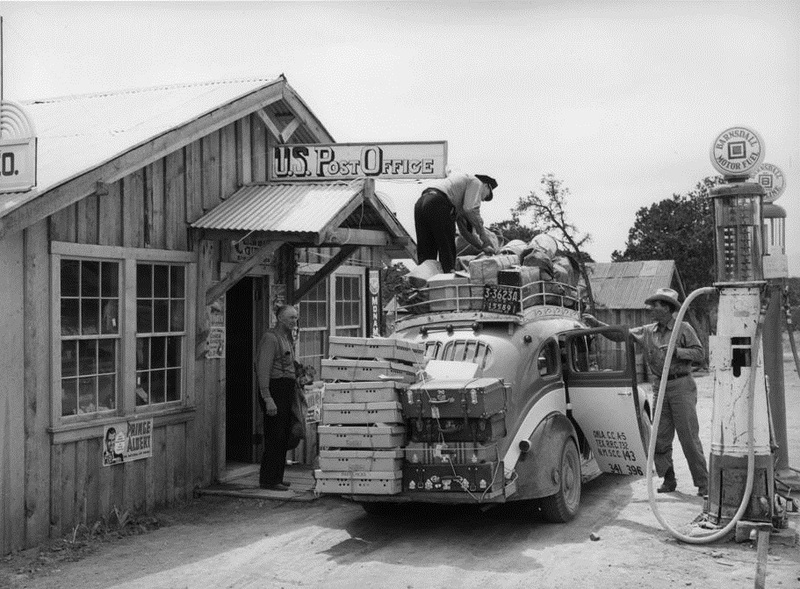 This is msuĺi delivery at Pie Town, New Mexico during the late 1930s. The flat crates tied on the back are baby chicks traveling as parcel post, probably 60 to a box. As you can see, mail arrival was like a circus coming to town. Before and during World War II my home was on a Missouri farm. Life was simple but effective. Our heat source was wood, our lights were kerosene lamps, our water came to the kitchen sink from a pitcher pump, and hot water came from a tea kettle. The needs we could not grow or manufacture we bought from Collier’s Mercantile – groceries, shoes, stocking, boots, and heavy work clothing. Everything else we ordered from the Sears Roebuck catalog. Anything and everything ca me from that source – baby chicks and ducks, mules, plows, tools, radios, phonographs, records, furniture, and more. Baby chicks were delivered by the mail carrier. Heavy stuff like mules and plows, cars, and motorcycles traveled by rail. Sears had a system that worked. But now Sears is going bust. Why? They invented the system. Basically, in my opinion, there is little different little difference between a paper catalog and a computer monitor. Sears made the transition from mail order to brick and mortar. Whatever became of the decedents of those creative people?